OutsidetheGarden.com - The Fish Bowl - Heads Up! Plenty has been written about the downside of the seemingly evident Lindros trade so we thought we'd try to look at the trade in a more positive light. The history is well known, drafted by the Quebec Nordiques, Lindros held out until he was able to force a trade to the Philadelphia Flyers, beating out a Rangers offer by a mere 20 minutes. Several concussions and a very public dispute later and we find Eric Lindros once again attempting to control his destiny. The Restricted Free Agent has held the Flyers ransom as he dictated to Flyers management a list of teams he would be happy to play for a list which added the Rangers over the summer. Yet despite all these questions, there are still teams interested in trading for the former star center. St Louis was rumored to be close to deal before acquiring Tkachuk, and much has been made of the Toronto negotiations which almost cost the Maple Leafs their post-season berth at the end of last season. At 6'4" and 230lbs, Eric Lindros has the size that the Ranger covet, a size that could allow them to match-up in the East and in particular the Atlantic Division which appears to have the largest group of centerman in the league One of the few big men with a scoring touch he plays a physical game which has been both a blessing and a burden. Numerous injuries throughout his career have hampered his effectiveness, not least of all a series of concussions, including four in his last season in the league. Perhaps the only thing that can be said about concussions is that the evidence appears to point to an increased susceptibility as athletes sustain more of them. One only has to look at the recent trials of Quarterbacks Steve Young and Troy Aikman whose careers were cut short by multiple blows to the head. Over the last few years concussion diagnosis has improved dramatically allowing concussions to be diagnosed earlier and more often. Unfortunately the treatment and prevention are yet to catch up. It's not a given however, that Lindros will be the walking time-bomb that most predict. A year off and a full medical clearance may mean it's time to look past those injuries to the player the Rangers could very well find themselves with by the end of this week. 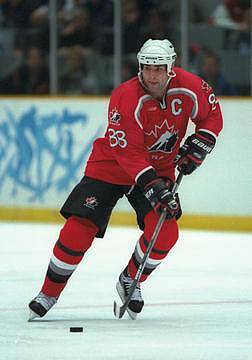 Eric Lindros is perhaps one of the most complete offensive players in the league today. He brings to his team the abilities of a genuine first line center who can win draws, score and be a physical presence on the ice, something the Rangers have lacked during their long playoff drought. At 28, he still has the potential to play at a peak level for a number of seasons, and it certainly seems that the Rangers management believe this to be so, as evidenced by their apparent eagerness to sign him to a four year contract to prevent him leaving as an unrestricted free agent when he turns 31. A healthy Lindros is a no-brainer for the Rangers, but are they risking too much by giving up Johnsson, Hlavac and Brendl. Kim Johnsson appears the easiest to replace. A solid puck moving defenseman, Johnsson is coming off an impressive World Championships for his native Sweden and his second year in the NHL. From the very beginning it was evident that Kim's strength was his puck handling and skating something the Rangers now find themselves overloaded with. Lacking strength and size, the young Swede often struggled in his own zone and in front of his own net and it wasn't until he was paired with Tomas Kloucek that he appeared to come into his own. Any one of Mottau, Smrek or Van Impe look likely to take his place, with Filip Novak and Matt Kinch providing some added incentive to move him. The player the Rangers will most likely miss will be Jan Hlavac. The 24 year old Czech winger has blossomed into an offensive threat and could yet develop into a true sniper with 35-40 goals certainly within his reach. His offense may seldom be questioned, the same cannot be said for his defense and physical play. Like Johnsson, Hlavac was an example of what was wrong with the Rangers and it could be him that pays the price for an overall lack on the team. Perhaps the most troubling addition is that of Pavel Brendl, dubbed everything from the next Jaromir Jagr to the next bust. The 20 year old Czech has yet to play an NHL game, but has already drawn some lofty comparisons, but questions over his desire and work ethic continue to surface. As with any prospect, the inclusion of this young player in a trade will be best viewed in hindsight but the number of voices calling into question his potential has steadily been growing. The risk-reward on this deal is high, but the fact that the Rangers could get a player who actually fills a need will be a refreshing change. The loss of Hlavac, Johnsson and Brendl could easily come back to haunt the team, but with still much of the youth left and a commitment to a more balanced style of play may prove to be the one thing that turns this franchise around.